My trick for making the worlds best meatballs? A (no longer) secret blend of spices makes this recipe for spaghetti with spicy meatballs so delicious! Fun fact - despite cooking almost exclusively vegetarian at home, I make the worlds best spaghetti and meatballs. True story. There was an awards ceremony and everything. I even have a trophy sitting on my mantle. I kid, I kid. But seriously, I make pretty tasty spaghetti and meatballs. With other classic dishes I prepare again and again, I usually try a new recipe each time. But once I struck upon this recipe for spicy meatballs, I never looked back. Other than a few dalliances with vegetarian 'meatballs', I'll never stray from this recipe. The secret is the spice mix - allspice, chile powder and a little cayenne for heat. It's pretty much perfect! It's recommended to do a blend of meats for meatballs, usually beef, pork and veal, but I usually just stick with beef or turkey for the ease of it. If you feel like sending me flowers after tasting these meatballs, please email me for my address. Also, I like hydrangeas. Add panko and milk to a large bowl and mix together. Let sit for 5 minutes. To the breadcrumb mixture, add the ground beef, onion, garlic, egg, spices, salt and pepper. Using clean hands, mix to combine until well distributed. Form into 16-18 balls slightly smaller than a golfball and place on a plate. Refrigerate about 1 hour until ready to cook. Heat olive oil in a large skillet on medium high. Add meatballs and brown on all sides. Remove meatballs to a plate and set aside until ready to use. Next, make the spaghetti. Bring a large pot of water to a boil and cook spaghetti according to package instructions. Drain and set aside until ready to use. Heat olive oil in a medium pot on medium high heat. Add onion, garlic and red pepper and cook until tender, about 5 minutes. Add red pepper and ay leaf and cook an additional 1minute or two. Add tomatoes, bring to a boil, reduce heat and simmer. Add meatballs to the sauce when simmering, cover and let cook about 10 minutes until flavors have melded and meatballs are cooked through. Divide spaghetti between bowls, top with 4 meatballs each and sauce. Serve garnished with parmesan cheese. Prefer meatless? 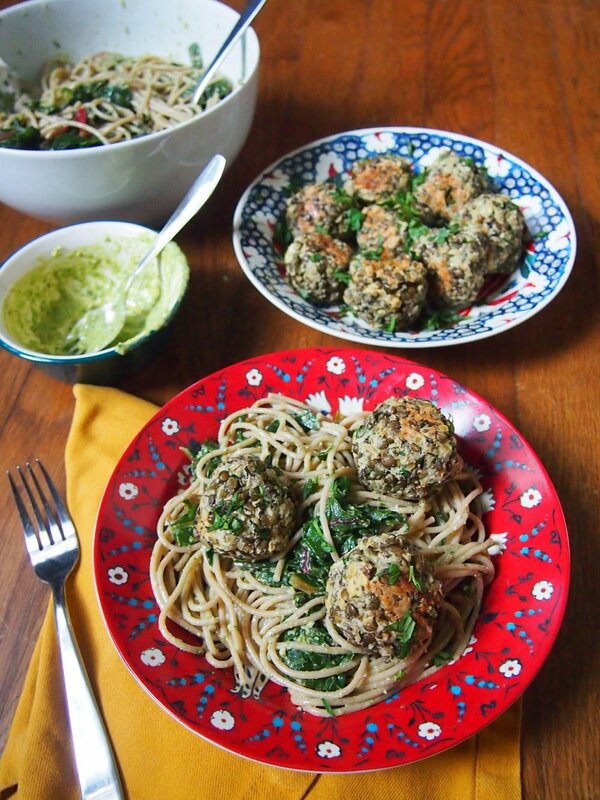 Here's three veggie meatballs for you to try!